Southwest holds the notable status of being the only country-wide carrier to not charge passengers for second checked bags. Over the past few months, all the legacy airlines and most of the low-cost carriers have added a charge for second bags, and last week American announced a $15 fee for first checked bags. “We’re doing everything we can do to boost revenue, but it’s not our goal to nickel and dime our customers,” said a Southwest spokesperson in the aforementioned New York Times article. There’s no telling how long Southwest will stick with its passenger-friendly fee policy, but during this tough economy, Southwest managed to be the only profitable airline in the first quarter of 2008 and recently ranked as the top U.S. airline in a major customer satisfaction survey. A big part of Southwest’s ability to deliver on its promises to customers hinges on the carrier’s fuel hedge funds. 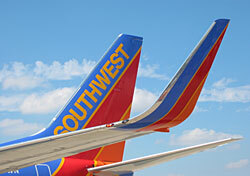 Essentially, Southwest was smart enough to lock in low rates for 70 percent of their fuel this year. They’re paying about $51 a barrel for hedge fund oil, while airlines that didn’t hedge or hedge enough are now paying about $130 a barrel. That’s a huge advantage for Southwest. Things could get interesting in the coming years, however, as the amount of cheap fuel Southwest has access to will drop a few percentage points each year until 2012, when this current fund runs out.